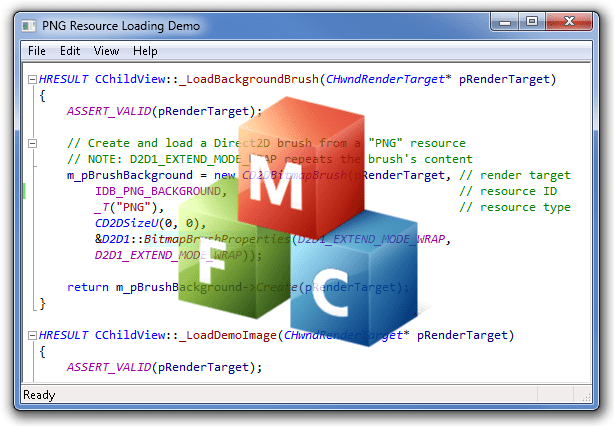 If ask Internet about how to “load PNG from resource” it gives in return a lot of examples using a bunch of code. We can use some stuff found there, but once using MFC and enabling Direct2D support, that becomes easier: just have to construct and create a CD2DBitmap object, passing the resource ID and the resource type. It’s also possible to easily load a Direct2D brush. Loading PNG is just an example. We can load other WIC-supported formats (includes “standard” formats like JPEG, TIFF etc. and other graphic formats which have a WIC decoder installed). 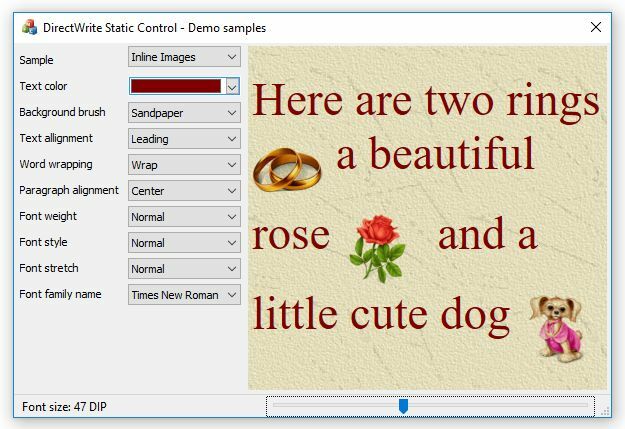 To see how to enable Direct2D support and further render the loaded images, see the previous articles and/or have a look in the demo application attached here. Codexpert: What is Windows Imaging Component (WIC)? This entry was posted in Direct2D, MFC and tagged Direct2D, mfc on 2016.01.18 by Ovidiu Cucu. 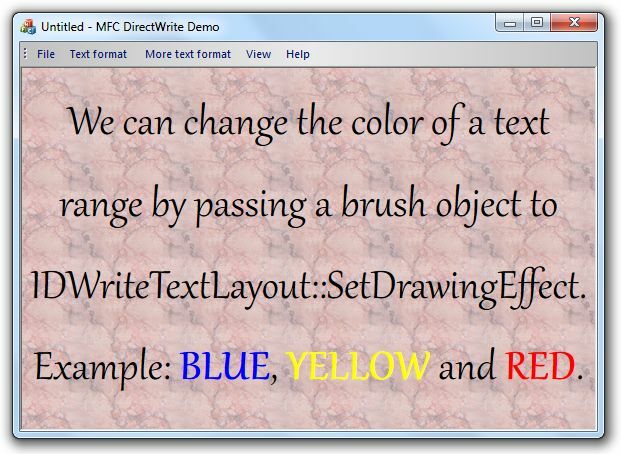 We can change the color of a text range by passing a brush object to IDWriteTextLayout::SetDrawingEffect. Here is a simple example. // Please, see the demo application for more details. // Draw the text in the render target. So far, there’s no much “special effects” in the above example. Although a little bit more difficult, it is possible to make more customized rendering like text highlighting, double/triple underline/strikethrough and so on. This will be the subject of a future article. This entry was posted in Direct2D, DirectWrite, MFC and tagged Direct2D, DirectWrite, mfc on 2015.08.30 by Ovidiu Cucu. 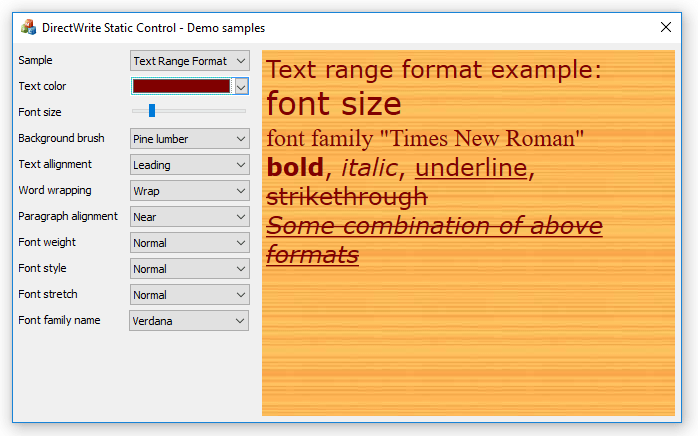 Some fonts like Microsoft’s Gabriola support a number of typographic features which allow users to control how they look, e.g by enabling some fancy stylistic text rendering. 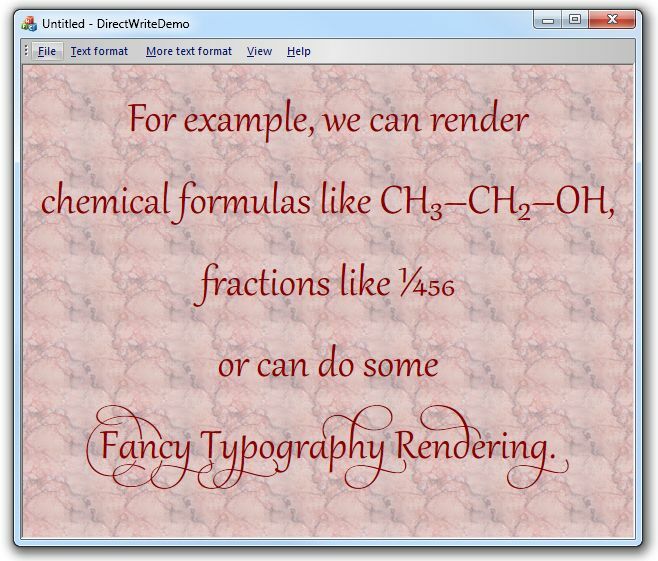 With DirectWrite we can do that by passing a IDWriteTypography object to IDWriteTextLayout::SetTypography method. In Visual Studio 2012, IDWriteFactory instance has been moved in a D2D-specific structure of type _AFX_D2D_STATE that can be accessed by calling AfxGetD2DState. See also: Getting Direct2D, DirectWrite and WIC Factories in MFC. This entry was posted in Direct2D, DirectWrite, MFC and tagged Direct2D, DirectWrite, mfc on 2015.07.26 by Ovidiu Cucu.